Contest call: "CQ RCWC" or "CQ RCWC TEST"
A1. Single op - guests of “RCWC”- more than 100 watts. A2. Single op - guests of "RCWC"- less than 100 watts. A3. Single op - guests of "RCWC" - without restriction on power, working at classical keys (Key, Side-swiper или BUG). B1. Single op - member of "RCWC"- more than 100 watts. B2. Single op - member of "RCWC"- less than 100 watts. B3. Single op - member of "RCWC" - without restriction on power, working at classical keys (Key, Side-swiper или BUG). Work of participants in the A3 and B3 groups will be written down in an audioformat for identification and rewarding for beautiful transfer. For example: in the first tour-599 001, in the second tour- 599 001 and so on. Members of the club "RCWC" transmit RST and the group (QTC) from 5 consonants of Latin alphabet different in each tour. and in the third round: 599 ZKMBN. QTC is created by the participant independently. In QTC there shouldn't be identical signs. as well as transfer to QTC of semantic Q-codes, for example: DXQSL; FBTNX. Members of the club "RCWC" transmit different QTC (formed by themselves) in every tour.
.:: Counting of result: ::. The result is the sum of points of two best tours from three. Besides, for the participants working in the class A3 and B3 at vertical keys (Key) the coefficient = 2, on keys like Side-swiper coefficient = 1.5 for participants of "BUG" working at keys coefficient = 1 is established. The sum up of the year will be conducted according to the best three results from four laps of the Cup. According to the sum up of the year plaquettes will be given in all classes provided by Regulations about sponsors. of the year diplomas will be sent by e-post. Logs are sent only in Cabrillo format. The participants participating in the class A3 and B3 in a line of SOAPBOX of the heading of the report specifies type of a key at which they worked (Key, Side-swiper or BUG).
.:: Address for logs: ::. In a subject of the letter it is obligatory to specify only a call sign.
.:: Deadline for sending the log: ::. All radio amareurs working CW. If there is an equality in points the preference has a participant who gathered the most quantity of points from confirmed received QTC. QSOs do not count. Participants from the A3 and B3 groups are obliged to carry out all radio communication only on the declared key type. Otherwise it will be transferred to the A1 or B1 groups respectively.
.:: THE SOFTWARE FOR WORK IN THE CONTEST::. 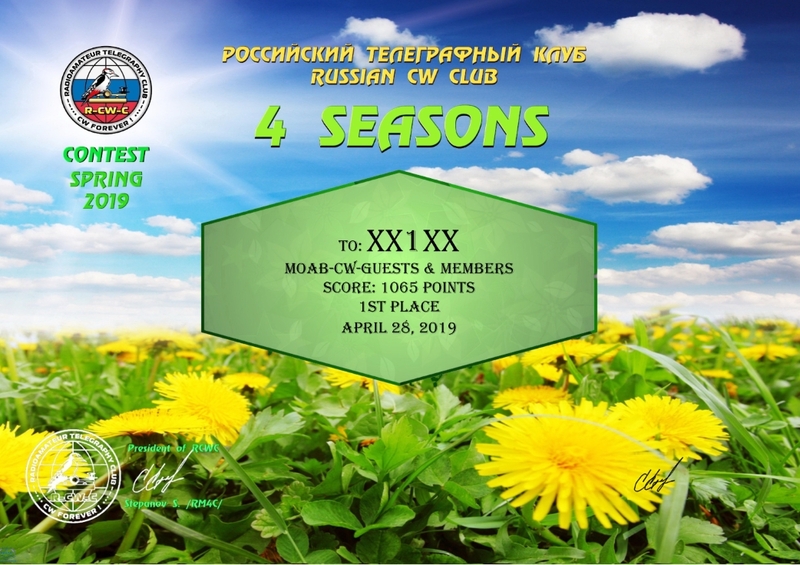 5MContest - in select competitions select the competition "4 seasons with RCWC"
TR4W >ARKTIKA-SPRING. When opening it a contest-logera in a window of "MY STATE" you write down the first QTC (for clubmen). And after the first round you keep Log in the separate file with a name, for example: R8OA B2 20 then you delete all Log from a contest-loggera and before the second round you open a new contest-loger of ARKTIKA-SPRING with entering of new QTC in the MY STATE window. The same actions you hold later 2 rounds. Not clubmen the MY STATE window leave empty in each tour.